They all loved the elegant packaging, the natural fragrance, and the fact that it gave ‘VISIBLE’ (that’s the tester’s capitals) results. They commented that although the products are expensive, they last for a very long time. SAMAYA is based on Ayurvedic principles, which aim for a perfect balance in everything. The founder, beautiful Abida Halstenberg, grew up in India steeped in Ayurveda, the traditional healthcare system - the name means science of life. Later Abida, by now settled in London, searched for a range of top quality, all natural and organic Ayurvedic skincare – in vain. So… with the help of expert chemists, she set up SAMAYA. On the website, samayaayruveda.com, you will find a questionnaire to discern your dosha, the type of energies that govern each one of us. Each of the three doshas, vata, pitta and kapha, corresponds to a set of physical and emotional traits. 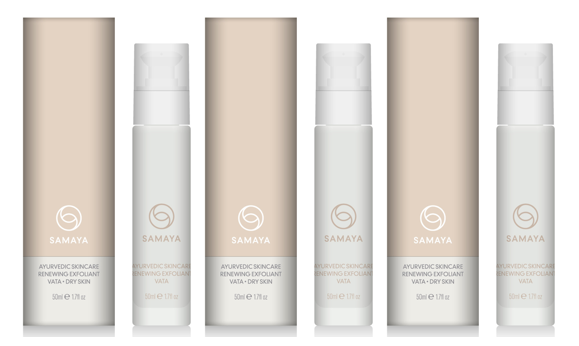 SAMAYA products are subtly different for each dosha. However, Beauty Bible testers all trialled the vata version and, as we’ve said, the results were spectacular. We are delighted to offer Beauty Bible readers the chance to win one of this truly fabulous new product – we’ve been trying it ourselves and we are very impressed. Working gently on the outer layers of skin, it actually dissolves the keratin protein that binds dead skin cells to our skin, revealing a smoother clearer complexion underneath. Use it every other night – you won’t need moisturiser afterwards – and watch its effect on fine lines, open pores, pigmentation, scarring and sun damage. For a chance of winning a Vata Renewing Exfoliant (50 ml), worth £59, simply fill in the form below. For more information about SAMAYA Ayurveda, visit samayaayurveda.com.